First, please thank our other web person extraordinaire, Jesse, who’s given you the option to get an email notification of when this blog goes out. You’ll see the spot to click “Profile” on the right hand side. Another excitement: The Arum italicums unfurled this week. I can’t wait to see their mature foliage against blooming columbines and bulbs. I’ll keep you posted on whether they weather the next several months. I know that it’s winter, even when the thermometer hits 80º , when the Angelica pachycarpa returns under the Chinese pistache. Recently, I underplanted it with Plumbago scandens. This summer white-flowering plumbago for shade will hold the spot when Angelica heads south in May or June. I’m sure it’s thankful, since it’s so darned easy to forget what’s hiding underground when the shovel passion hits. Recently, I got out the shovel to move the autumn clematis from behind the shed to the Amelia fence, where it can anchor on a woody coral honeysuckle (needs cutting back) and the chain link. When I planted this clematis behind the shed, in a spot visible from the cat cove, we had shade back there and reasonable rainfall. With the city’s creek project, now it’s full sun. And you know what happened to rainfall. To deal with water, a few weeks ago I ran a soaker hose along the back fence for the vines that aren’t easy to access with the hose or sprinkler. Still, one night I realized that the best thing to do was to move it to a more suitable spot: shade with nicks of sun, and close to water. It doesn’t need much water, but it needs some! Already it looks grateful. No pictures-it’s still having a bad hair day. If you have plants that are troubled by their location, this is a great time to move them to a better spot. In dry soil, water them in advance. As John Dromgoole said one time, “Let them know what you’re going to do.” Never fertilize during moves, but after I water, I do give them a dose of Medina HastaGro or a fish emulsion/seaweed/molasses blend. On troubled plants we couldn’t rescue, last year we bid goodbye to the Afghan pine we’d started as a seedling long ago. When I save enough pennies, the cottonwood that came with the house needs to join it in chipper heaven before it “renovates” the shed’s roof or the house. Whether you need to prune your trees or not, last summer and fall Tom and I got a lot of questions about trees, including well-established ones, that were troubled by drought. To answer some of our questions about tree symptoms and how to respond, this week Tom meets with Sid Morning from Good Morning Tree. Sid also throws in some useful insight about oak wilt. 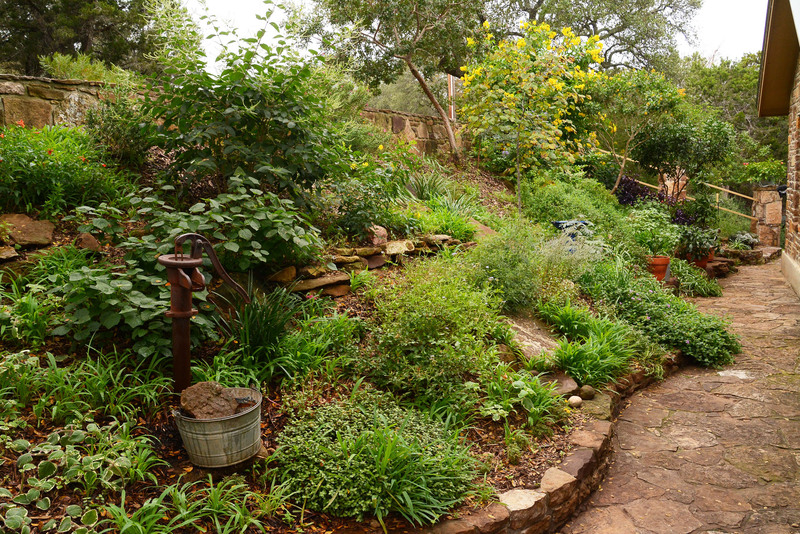 This week’s garden tour is thanks to a deal I made with Austin American-Statesman’s Renee Studebaker, award-winning page designer, garden writer and Renee’s Roots garden blogger. When she asked to come to my garden with a camera, I balked faster than a cat getting a pill. No way, no how. Hey, my job is behind the camera, not in front of it. Then, I had a brilliant idea. I would subject myself to “the media” if she would let me subject HER to “the media.” Talk about balk. Between the two of us, we could have formed a balk society. But as honorable people, we stuck to our bargain. CTG got the best of it, though. Renee’s garden is a gem that well represents her artistic flare, sensitive gardening philosophy, and plain sweaty hard work. It also represents her commitment to fresh organic food for the table she shares with partner Joe Stafford and his daughter Annie, and for the wildlife that dine alfresco. Important too is fellowship, and milestones with memories that make it uniquely her garden, as intimate to her history as pictures on her walls. Renee’s got the right attitude about gardening: perpetual curiosity, flexibility, patience, practicality, and personality. Mainly, she’s got the one thing that gardeners need most: a joyous laugh. This is late notice, but if you read this in time, jump in the car Saturday morning for the Texas Flower Bulb Society’s Festival and Sale. It’s this Saturday, the 17th, from 9 a.m. to 5 p.m. at Zilker Garden Center. These are local gardeners who know what works, so this is a great way to add to your bulb collection.